I’ve received a few different questions from readers regarding my move abroad in fall 2015 recently, so instead of just answering via my Beck and Call newsletter, I thought it would be great for y’all to have a dedicated post on the blog to get all of your questions answered and that you can refer back to whenever! Did you know I have even more travel tips for you? My Travel page has all of my city guides, travel diaries, tips and more. You can even discover content by location by selecting a hot spot on the map! 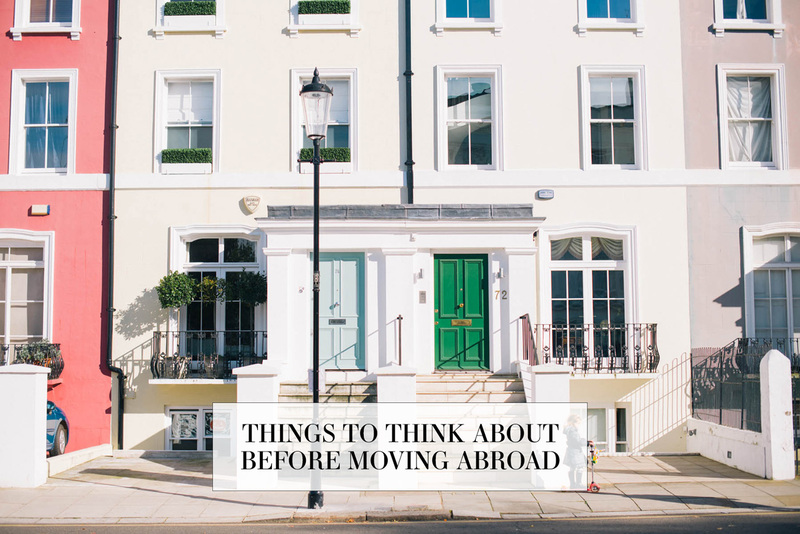 Click here to check it out, and read on for my tips on what to do and know before moving abroad. This totally depends on where you plan to go! As a US citizen, I was able to stay in the UK for up to six months without a visa. If you’re headed to the EU, the max is 90 days (three months). If you’re traveling for work or think you can get a visa to stay longer, that is definitely a possibility – it’ll just require more research and work on your part! Go to the government website of the country you plan to visit and find out what their visa and visitor requirements are! I really lucked out with my accommodations while abroad. I spent a lot of time researching and talking to friends and family friends about it, months before I even booked a plane ticket to see what my options were. It just so happened that one of my mom’s best friends has a cousin that lives in London and was open to renting me a room! Her eldest son was leaving for his first year at college about the time I was planning to arrive, so I just rented out his room. She was a very generous and gracious host, and thankfully didn’t charge me an arm and a leg – it was very doable. If that hadn’t worked out, I likely would have secured a flat through AirBnB, HomeAway or a similar rental service. They allow you to rent rooms or entire homes for your desired length of time! You could always stay in one part of the city for half of your trip, and switch to another flat somewhere else to get the full experience of wherever you’re traveling. Be sure to do your research on neighborhoods, access to public transportation and things like grocery stores, and look carefully through the reviews of each place. HOW DO I PAY BILLS BACK HOME? I would highly recommend taking all of your bills paperless before you leave town. Once you go paperless, you can pay for everything online with a credit card or via a direct deposit out of your bank account. Most of mine already are, so I didn’t really have to worry about that while I was abroad! In any case, I still had my house keeper collect my mail to make sure the mail box didn’t get too full while I was gone. My mom also came to Dallas a few times while I was over in London, and she went through any bills for me and sent me photos of each to find out if anything needed to be responded to or done ASAP. I would recommend having a family member or friend stop by your house a couple times a month to check on your place anyway, go through the mail and just keep an eye on things! DO YOU NEED A BANK ACCOUNT? HOW DO YOU GET MONEY? Although I was in London for a pretty decent amount of time, I never had to open a bank account. If you have a visa and plan to stay somewhere more long-term, you will likely need to rent an apartment vs an AirBnB. In order to rent an apartment, you will definitely need a local bank account. I discovered this while doing my initial research for London, which is why I decided to only stay for five months – originally I was thinking I’d stay even longer! You may also need a local bank account for paying for a phone if you plan to do something contract-based, but I just went in each month and paid a flat fee for a certain amount of data. I wasn’t making any local calls either, so I was really just in it for the data/internet connectivity. If you’re only going abroad for a few months, I would suggest ordering foreign bills through your bank in bulk prior to your departure. I didn’t have to worry about hitting up an ATM for awhile or worry about crazy exchange rates at the airport. I arrived in London with plenty of pounds, but also had pre-ordered money for Berlin, Amsterdam and Prague since I was heading there shortly after my arrival in London. The woman I was staying with let me store the extra cash in her safe for the time being. Luckily, my bank here has a sister bank over in London, so I was able to use their ATMs with no problems or fees for withdrawals. Again, talk to your bank about your best options here! If you plan to stay in a country long enough to get a job and not be considered a visitor, you will definitely pay taxes. Unfortunately as a US citizen, you are still responsible for paying your US taxes too, in addition to paying the foreign country’s taxes. This is probably the biggest downside to permanently moving abroad, which is why I decided to visit within the six month timeline. WHAT DO I PACK FOR SUCH A LONG STAY? Stick to the wardrobe basics! I took a bunch of pairs of jeans (black, white, blue), leggings, tees, sweaters, jackets, sneakers, flats and boots. I brought a few pairs of heels (mostly for outfit photos and nice dinners), but I primarily wore comfortable flat shoes or my Newbury boots while wandering around London or traveling. I mostly brought neutrals and solids, with the exception of a few stripes and a couple statement pieces to keep my going out outfits exciting. London was pretty chilly the entire time I was there, so I almost never wore tanks – it was almost always a sweater or long-sleeve tee with a jacket or coat! I ended up having to buy quite a few new coats while I was over there, because I didn’t bring enough options with me. Now as far as furniture and home things go, I’m not an expert here – I didn’t bring anything with me because I was just going for a few months. I do have friends who have moved over there for a few years, so what they did was put all of their stuff in storage and got rid of their place here in the US so they didn’t have to pay two rents at once. Once they got over to London, they purchased inexpensive furniture and decor, or you could also find somewhere already furnished to live (like an AirBnB or corporate apartment if you’re going for work). WHAT IF THERE’S A MEDICAL EMERGENCY? Wherever you plan to travel to, be sure to research and consider the healthcare system and how it all works. Especially if you have any chronic or potential health issues! I only ever had an issue one time, but luckily the woman I was staying with recommended a concierge doctor that came to the flat – it wasn’t cheap, but it was worth avoiding the hospital. WHAT IF I WANT TO BRING MY PET(S)? If you have a dog or cat and want to bring them with you, you’ll definitely need to do some research. Some countries do not allow this, and others do. Some will require a quarantine, others just require paperwork. London, for example, requires your animal has been microchipped, has a “pet passport” or veterinary certificate, has been vaccinated against rabies, and it must arrive in the UK within five days before or after your arrival. You may also want to research the cost of transporting the animal overseas – airlines offer several options (cargo, under the seat, baggage, etc), and the prices will vary depending on what you pick. DID YOU GET HOMESICK? WILL I? I personally did not get homesick while I was abroad. I did however miss my family and friends. Luckily, I had several friends and family visit while I was abroad which helped break that up a little bit, and it also helped that I had friends back home who connected me with friends over in London so I could establish connections immediately. I always had something to do and people to hang out with, which was great! IF YOU HAD TO CHOOSE A CITY AND DO IT ALL OVER AGAIN, WOULD YOU STILL CHOOSE LONDON? Absolutely, 100%. Since I was traveling alone for such a long amount of time, I really enjoyed being in a country where a language barrier wasn’t an issue. I felt more in control, safer and had zero issues getting around town since all of the signs, menus, drivers, etc featured or spoke English. It made day-to-day life over there seamless and comfortable. I had a dedicated barre class I went to (it helps that the instructors speak English haha! ), there was a Whole Foods right around the corner from my place, and it was easier to make friends since we all spoke the same language. In addition to some British folks, I made friends with some girls and guys from Australia and South Africa! It’s also incredibly easy to travel to and from London! I took trains and buses in and around the English countryside, took the chunnel to Paris, and the flights were direct to pretty much everywhere I wanted to go: Amsterdam, Vienna, Krakow, you name it. I’d go back to London in a heartbeat if life opened up that possibility again! You can check out all of my content from London here! Awesome list of things to think about! What a great resource, Merritt! I’ll definitely be sharing. I love this post!! I studied abroad in London fall of my junior year and then I went back for an internship the following summer, so you could say that I’m a little obsessed with the city! My boyfriend and I are actually taking a trip to Paris and London in March and I’m so excited to show him around London! I studied abroad in London and am DYING to return for more than just a quick trip — I was always curious how you did it! Thank you for the tips, seriously, they’re so helpful! the switzerland itinerary is live!